Seven Stars Country Store welcomes you to our small store with a big attitude. 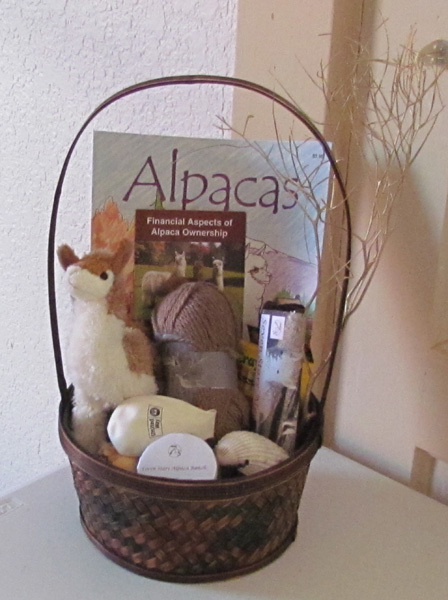 We are packed with alpaca goods, and other fine merchandise. The softest, warmest socks for your feet, hats for any type of occasion, sweaters, capes, and vest that are great gifts either for you or that special someone, warm alpaca blankets and rugs made from our own alpaca fiber. We also carry yarn that has been processed at a mill with the highest of standards for that special garment you wish to make yourself. We think you will be delighted with the quality, quantity, and our many unusual items such as wood bowls, ring bowls, and fiber bowls, along with souvenir cups, glasses, and t-shirts as reminders of your time on the Seven Stars Ranch. Soft alpaca bears and darling alpaca toys. Gift baskets can be arranged with merchandise of your choice. Alpaca hats, gloves, and scarf sets. Either purchased as sets or separately. Cuddly alpaca and llama toys.